It’s clear we’re in very (old-school) metal territory here. Denim jackets with patches galore, and T-shirts emblazoned with pointy lettering. Studs. Piercing. Tattoos. Beards. At least I have a beard, even if it’s not very metal. Dream Tröll (let’s not even start on that) have brought a fair few mates, most of whom are willing to participate in their awkward waving of rock ‘horns’. They’re polished (apart from the false start at the very beginning of the set) but seriously overblown in their Iron Maidenisms and the Spinal Tap posturing. Each of the guitars has additional strings – all the more to widdle on. It’s corny, cliché, and a bit cringey, especially the singer’s moves. The ten-minute overrun on a half-hour slot really doesn’t swing it for me, although no-one else seems too fussed. Grave Lines, who’ve supported the mighty Moth on this tour are an altogether different proposition. Stripped back, minimal and uncluttered inn every way, theirs is a sound that’s dark, slow, and spacious. Dolorous bass notes boom a sonorous death knell. It’s heavy, the anguish and nihilism pouring in a copious spate from every note, every thunderous, crashing beat, every crushing, pulverising power chord. It’s epic and then some: the guitarist unleashes one of the most insane and brutal screeching solos I’ve heard in ages around eight minutes into the set’s opening song. Drummer Julia Owen looks demur but is a hard hitter, and hammers out some complex, machine-like rhythms. It all coalesces to create something grainy and intense that sits somewhere between Neurosis and Godflesh. Oh, and the guitar sustain! It really does go on forever. Last night of the tour, and the well-polished Back Moth are back home to celebrate their return. And it’s a triumphant one. They’re straight on, straight in, heads down and banging. On their third album and after extensive touring, they’ve got it nailed. 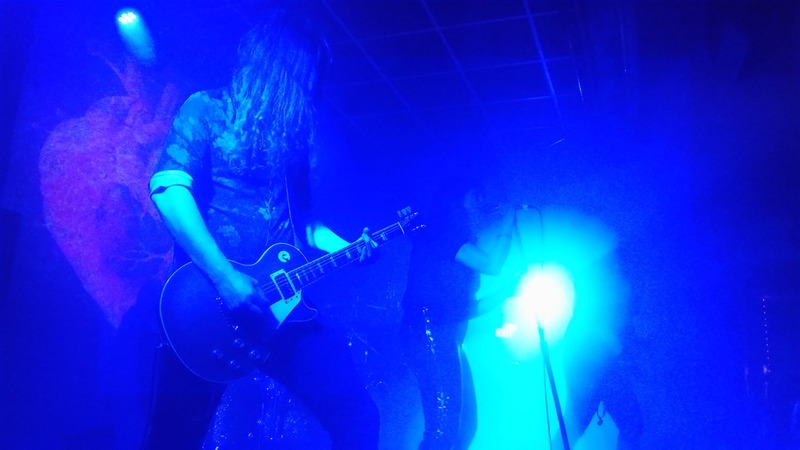 ‘Istra’, ‘Moonbow’, and ‘Severed Grace’, all from the new album, Anatomical Venus kick start the set. The album isn’t even out yet, but they feel well-embedded, and the audience respond like they’re familiar favourites. They don’t chat all that much, but instead let the songs speak for themselves. Actions speak louder than words, and guitars speak louder than anything. Harrier air-guitars unselfconsciously, and everything about the band feels natural. Moreover, they do really look like they’re enjoying themselves. And so they should. Especially when the members of Grave Lines race on stage and empty sacks full of balloons (black and purple, of course) all over during ‘Loomer’, giving the show an 80s Top of the Pops / party vibe, and the support act’s front man Jake Harding joins the band to perform ‘Tourmaline’: the dual vocal brings an almost Alice in Chains quality which accentuates the band’s more grunge-inspired leanings, and reminds that Black Moth, for all of their classic hard rock credentials are a band with some range. If my numerous of Black Moth from over the last few years – and, indeed, over the span of much of their career – could probably be boiled down rather embarrassingly to riffy riff riff, it’s a fair summary of what they do, and now more than ever. 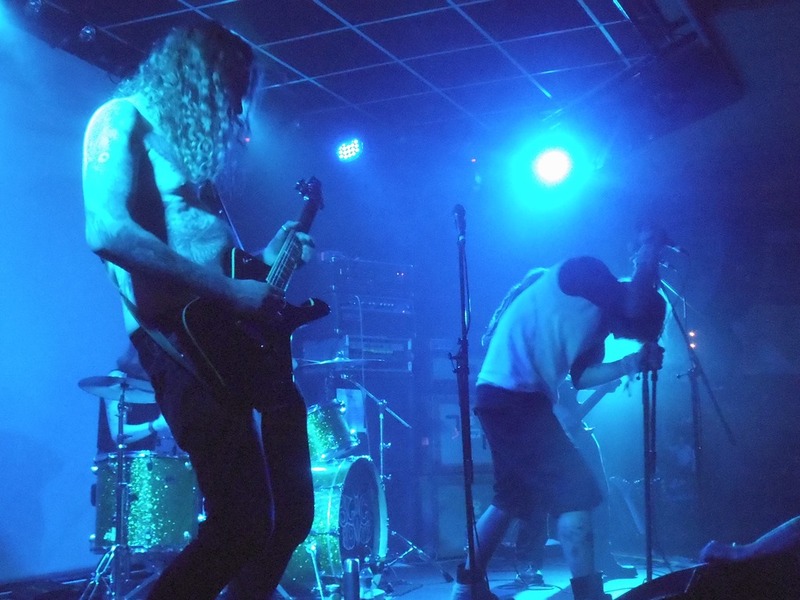 With Anatomical Venus they’ve draw it all righter and kicked it up heavier, and with the new set drawing largely – and confidently – on the new material, the Moth really pack in the riffs to deliver a cracking set. If ever a band was at the top of their game, it’s Black Moth right now.